In honor of the fall season (and my LOVE for coconut milk) I decided to make and share with you this simple Pumpkin Curry soup recipe. My favorite part about cooking with pumpkins are roasting the seeds afterwards. They’re so easy to make and there are SO many different options for dressing them up: roasted with sea salt, cajun, cocoa…for a sweet treat, curry power, lemon pepper, pumpkin pie spices…oh and the list goes on. The longest part to the below recipe is roasting and peeling the pumpkin so plan on roasting it for at least 30-40 minutes (this can also be done ahead of time). After the roasting the rest is as easy as pumpkin pie. Preheat the oven to 400 degrees. Cut the sugar pumpkin in half, remove the seeds and place them in a bowl to the side. Discard the steam. Rub both sides of the fresh pumpkin with a 1/2 tablespoon of butter. Place the pumpkin, flesh down, on a baking sheet rimmed with foil. Roast for 30 – 40 minutes. While the pumpkin is roasting, clean the discarded pumpkin seeds throughly by removing any left over pumpkin pulp and rinsing them in water with a colander. Inspired by Elise’s recipe for the perfect roasted pumpkin seeds, I boiled the seeds for 5-10 minutes in salted water. Drain the seeds, lightly pat them dry and then toss them lightly in olive oil. Arrange the seeds on a baking dish, coat lightly with sea salt and roast in the oven at 400 degrees for 10-15 minutes. Keep an eye on them so that they do not burn! Remove from heat and allow to cool. After the pumpkin has slightly cooled, peel and dice it. 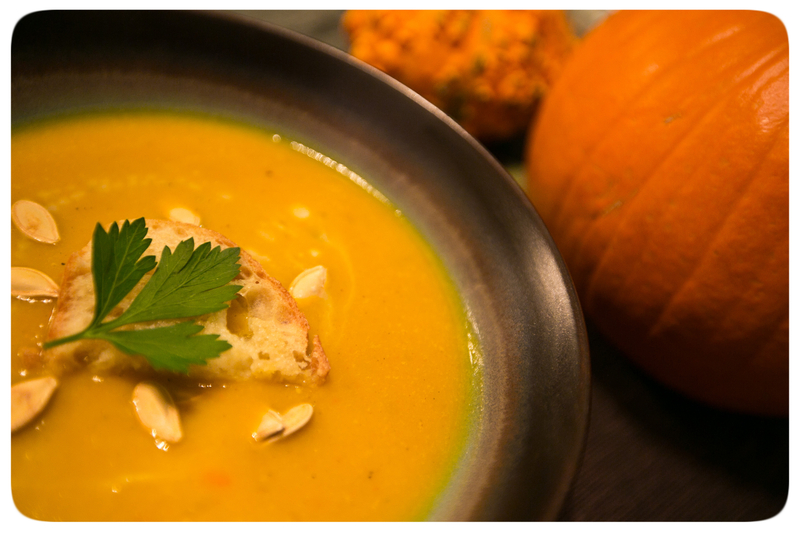 Melt the butter in a soup pot and then add the pumpkin, onions, carrots, celery and garlic. Cook on medium heat until soft. Add the curry, ginger, salt, pepper, and 1/2 cup of the chicken stock and let simmer for 15 minutes. Add the coconut milk (reserving a little bit for garnish) and the rest of the chicken stock and cook for another 20 minutes. Remove from heat and puree in a blender until smooth. Garnish with warmed coconut milk drizzle and roasted pumpkin seeds. Dang – that looks good! I love coconut milk too – so I’m going to look for a sugar pumpkin. . . .
Made this for dinner, was delish!!! Thanks, ladies! Awesome! So glad you liked it and thanks for sharing with us!